Colder: Exit row seats tend to be one of the coldest climates on the aircraft since you’re right beside the drafty door. Have fun trying to find extra blankets to keep yourself warm. Smaller Seat Width: Exit row and bulkhead seats are smaller because the tray table has to fit inside the armrest. Those extra inches do make a difference. No Seat Pocket Storage: No seat back pocket (because there is no seat in front of you) to store your books, magazines, water, iPod, headphones, glasses, etc. You will either need to keep them all on your lap or constantly get up to store them in your bag, in the overhead compartment. No Space for Bags: No seats in front of you also means you can’t store your bag/purse under the seat in front of you. You will have to place it in the overhead compartment. Beside the Toilet: Often these seats are right near or beside the lavatories. This means people will be constantly swarming you while waiting in line. Not to mention the smell. Also, flight attendants spray out the lavatories a couple times during the flight with strong disinfectant sprays which are quite harsh on the lungs. It will be noisy and uncomfortable, and don’t even bother trying to sleep. Leg Room: Sure, most exit/bulkhead seats have extra legroom – but not all! 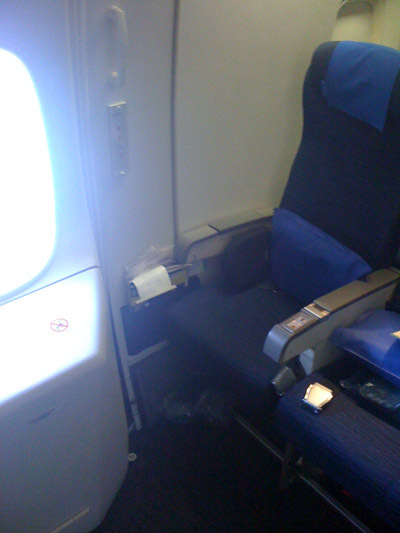 The window seat of the exit row is usually obstructed by a large slide cover on the emergency door (i.e. Boeing 747-400 aircrafts). This gives you even less legroom than a regular economy seat. And no, you’re not permitted to rest your legs on the slide cover due to safety reasons. Next time you fly, visit SeatGuru.com to find the best seat for you. They offer airline seating charts categorized by airline and aircraft type. Color codes on seat maps let you know which seats are optimal on all major airlines. They also offer seat pitch and width measurements to make your seat choice a little easier.